If you think that moths are boring brown bugs that fly around at night then think again – just take a look at some of the moths in the poster below! 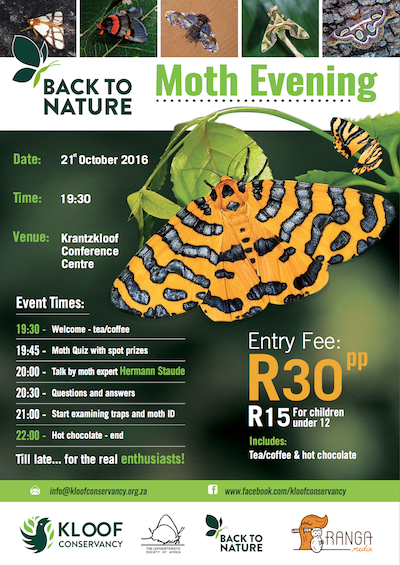 Join the Kloof Conservancy moth evening on Friday 21st October when Herman Staude one of SA’s leading experts on moths will be giving a talk and will be on hand to talk to participants about these fascinating creatures! Also on hand will be Steve Woodhall who also knows a thing or two about moths! This is a joint venture event with Lepsoc.